Infeed grind a fuel injector valve to close tolerance. The customer previously had many grind processes to bring a fuel injector needle valve to tolerance. Some of the tolerance features were extremely close roundness, surface finish and gauge point diameter from a length. The part must create and hold a seal at the seat surface of the valve. The cycle time was not a critical aspect to the project. Part changeover time was not a critical aspect to the project. The success of the project was to be measured in reduced failure rate over the production run. The previous process was not consistent and not reliable. Too much time was spent inspecting and having low yields. The profile shape of the part required a CNC work wheel dresser to allow flexibility in dressing parameters. The tolerance of roundness and gauge point diameter was met with a Stable and Rigid BEDROCK granite machine bed. 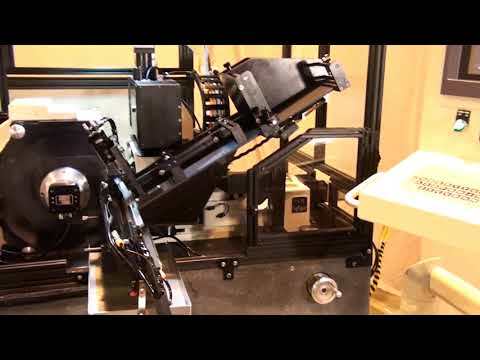 The Ram Bed Position Control was our High Accuracy using Frictionless Cross rollerways and a precision ball screw. The servo motor and glass scale encoder has increment of 1/10th of a micron. The grind was an infeed grind of a profiled blank. We needed to remove a significant amount of stock and hold a tight tolerance. 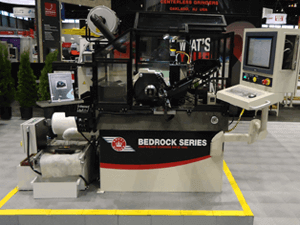 The ram bed position control had multiple grind rates within a cycle. This allowed us to take more stock off initially and then to slow the infeed rate near the final size, all in one infeed grind. Studies of wheel specifications and testing different bonds and grain type resulted in a wheel which was friable to break away the grain to keep the wheel sharp. 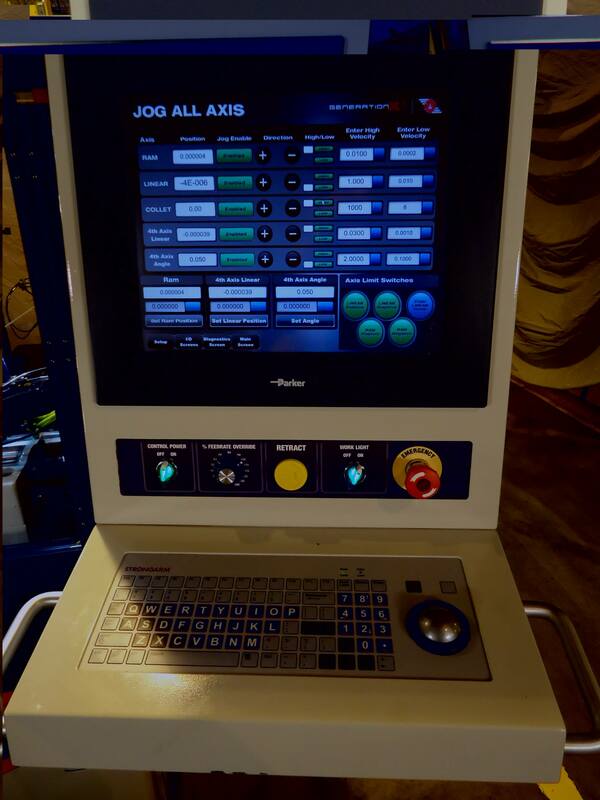 This wheel had a consistent result and the auto compensation feature of the High Accuracy control worked perfectly well in this application. The CNC wheel dress could be utilized to test different diamond paths to create the sharpest corners on the part profile. Diamond disc speeds and feeds were tested to come up with just the right surface finish on the part grind. 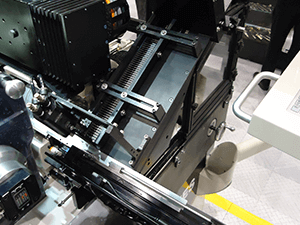 The flexibility of the machine controls allowed us to fine tune the set up to deliver just the right process. 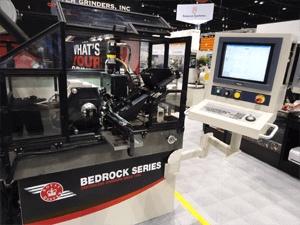 A magazine part loader delivered a steady supply of parts allowing the operator to tend to other responsibilities without interrupting the grind process efficiency.